← Rufus finally figured out what "one strike you're out" means. I saw a great egret on top of my house yesterday afternoon. Up till now, I had only seen great egrets flying high over my house, en route to or from a body of water which are all over Oklahoma City. On one hand, I was very excited to see a great egret at my house, but on the other hand, I’m really sad because he was there to try to eat my fish. He was on top of the house and peering down at the pond. He was trying to decide whether to risk flying down to it since my hubby and I and the three dogs were all outside. Sadly, the camera was in the house, and we didn’t want to scare it away by getting up to go inside to get it. As a bird watcher, I am thrilled that a new bird came to my yard. As a goldfish owner, I am pretty concerned. Most of our fish are children of our two biggest fish, so we’ve watched them grow up. I get attached to my pets pretty quickly. I suppose we know now what became of my fish Terry. We bought Terry and Moby a few months ago to add some variety to the pond. They were shubunkins, which are a variety of goldfish that are colored like calico cats. Terry disappeared shortly after we got them. Most of my fish are gold, but a few have white spots. The thing is, most of the goldfish look alike and so we probably wouldn’t notice if one was missing. We noticed that Terry was missing because he had distinctive spots. I would imagine great egrets have come to my pond other times when I wasn’t outside. 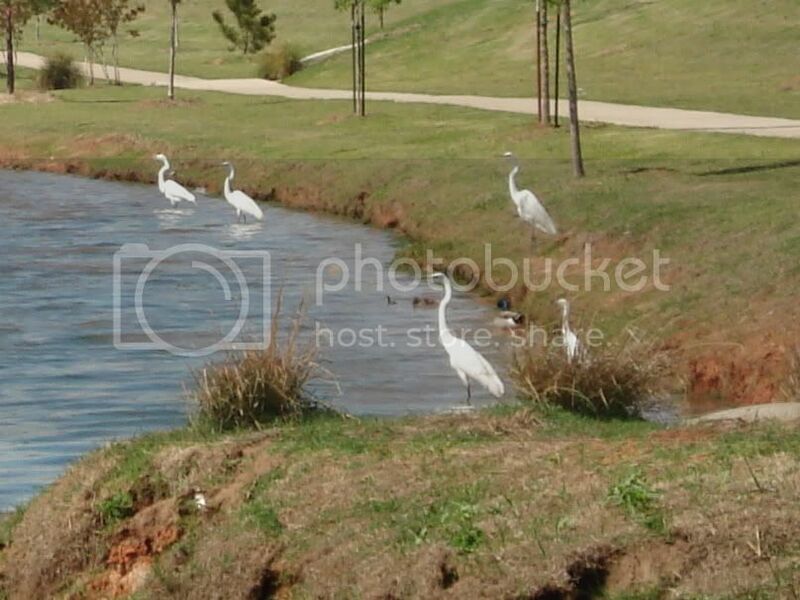 Here’s a picture of some great egrets. There is also a a snowy egret in the picture behind the bush.There is a daddy mallard with his babies in the picture too, so you can see how big of a bird they are. We took this picture at a nearby man made lake. So, am I happy that I’ve attracted a new bird to my yard, or am I sad? I haven’t decided yet.